For as long as I can remember, I’ve loved sauerkraut. As a small child, my mom served it on a regular basis with roast and mashed potatoes. I would scoop out a hole in my mashed potatoes, fill it in with sauerkraut and then dish on some gravy. Oh, what heaven for my taste buds! Years later my mom started making her own sauerkraut. She told me how healthful it was and that it was the method that her German mother and grandmother and their generations beyond had always used to make sauerkraut. Demonstrating, Mom started by shredding numerous heads of cabbage, sprinkling salt onto each new layer of cabbage as it was packed into her three-gallon crock. She then placed a plate on top of the cabbage weighted down with a plate-sized rock and let it set. Occasionally she removed what she called “scum” from the surface of the liquid that covered the cabbage. I found this to be quite distasteful and wondered how safe this “new-old” method could be. 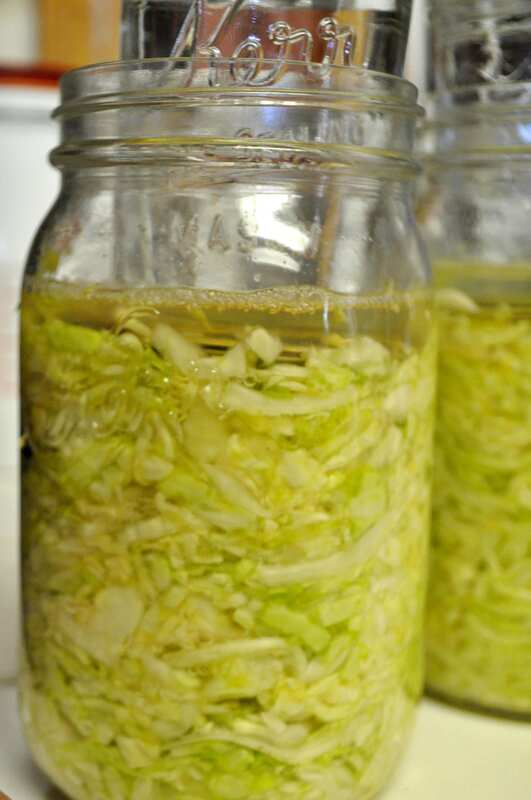 At the time, I didn’t understand what the benefit was in pickling cabbage like this and since my mom couldn’t really explain it to me, I continued to eat the canned sauerkraut I had grown up enjoying. In fact, being ignorant of the “lacto-fermentation” process, I thought that eating Mom’s sauerkraut would be a risky thing since it wasn’t canned in vinegar, heat-processed, sterilized and vacuum sealed – in other words, dead. After all, my mom herself had taught me how to “safely” preserve foods by either the water-bath method or by pressure canning. Fast forward to seven years ago. My mom came to live with us. At about that same time my husband and I began eating a traditional diet and I soon discovered that one of the most healthful elements of such a diet was lacto-fermented foods. These foods keep the digestive system populated with billions of beneficial bacteria, arming the body with a well-functioning and protective immune system. Needless to say, my mom was thrilled! This is what she had instinctively known, but couldn’t explain to me during all her years of kraut making. So we’d come full circle now that I had taken up my mother’s, grandmother’s, great-grandmother’s – who knows how far back – method of making pickled cabbage. All kinds of fruits and vegetables can be preserved by this method. Recipes for cucumbers, carrots, beets, green beans, pearl onions, radishes, Swiss chard ribs, tomatoes, turnips, zucchini, eggplant and snow peas are but a few of the vegetables featured in the book Preserving Food Without Freezing or Canning. And the variety of fruits is equally diverse – plums, peaches, pears, apples, mango, papaya, lemons, raisins, oranges, apricots, berries and more. Nourishing Traditions Cookbook features recipes for all of these fruits. 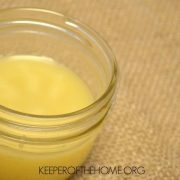 The most obvious benefit is that lacto-fermentation preserves food. Lactic acid is a natural preservative which safely inhibits bacteria that causes food to spoil. When lactic acid is present, putrefying bacteria isn’t. It’s as simple as that. The good bacteria keeps any bad bacteria from invading. 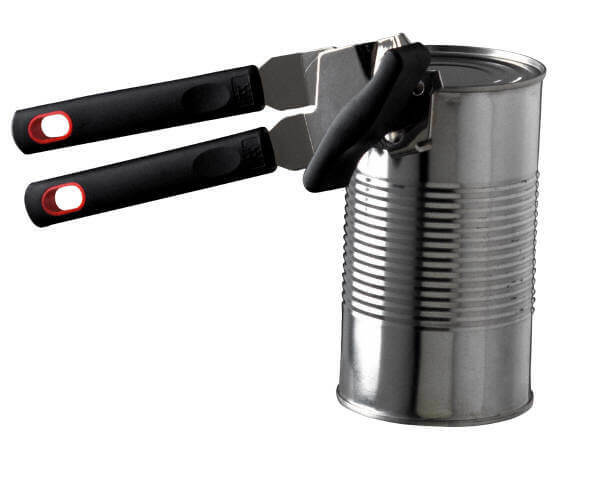 You will never have to wonder about botulism when preserving foods with lacto-fermentation since that deadly bacteria only grows in a vacuum (heat-preserved foods are vacuum-sealed). If you happen to have a failed batch of pickles, for instance, your nose will quickly detect the spoilage. It will smell so bad, disposal will be the only option, never to come anywhere close to your dinner plate. Foods preserved with lactic acid are not only completely safe to eat – this knowledge disarmed my fears that I’d had during those years I wouldn’t eat my mom’s sauerkraut – but nutrient levels are enhanced in wonderful ways (see next paragraph). This is the opposite or conventionally preserved foods (processed by heat and/or vinegar means), which strip foods of their vitality. sixty barrels of kraut lasted for twenty-seven months, and not a single crew member developed scurvy, which previously had killed huge numbers of the crews of long sea voyages. Another wonderful benefit is the simplicity of preparation. For 25 years I labored intensively, sterilizing jars and lids, standing over huge boiling pots at the height of summer heat to produce thousands of jars (an average of 500 jars per summer) of devitalized foodstuffs by conventional canning. It was literally the hardest work I’ve ever done. Lacto-fermenting foods has been a breath of fresh air for me. By comparison, it is the easiest, most satisfying work I do with food, producing the most nutritionally optimum, delicious fare. Try it out! Use the following tutorial to make some nourishing and delicious sauerkraut. Supplies you’ll need: Wide-mouth quart mason jar, two regular seals (the flat part of the lid), one half-pint jar that will fit into the wide-mouth mason jar, utensil for tamping down cabbage (look at the photos below to see the utensil I use), wooden cutting board, sharp knife for shredding cabbage, large mixing bowl, measuring spoons and a cloth to cover jars. Ingredients you’ll need: 1 1/4 – 1 1/2 pound cabbage, 1 tablespoon unrefined sea salt, 10 juniper berries or 2 teaspoons caraway seeds or several bay leaves (these are all optional), filtered water (non-chlorinated), extra salt. 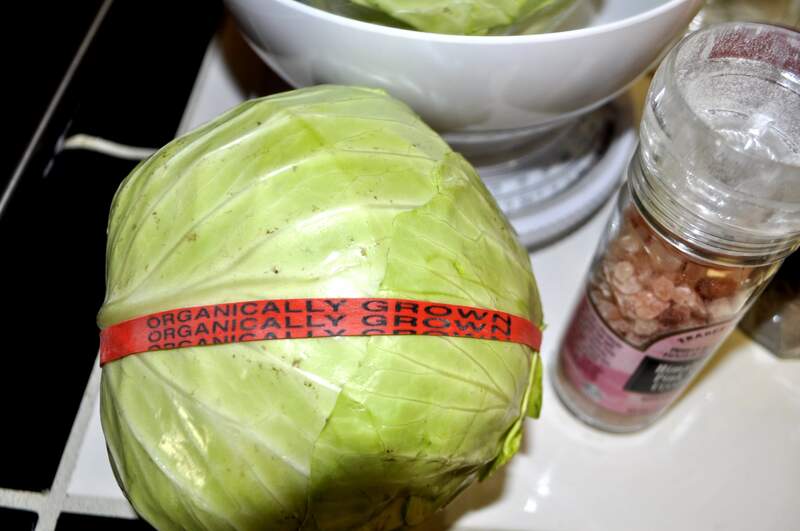 Select only organic cabbage, either red or green (or mix the two colors for pink sauerkraut). 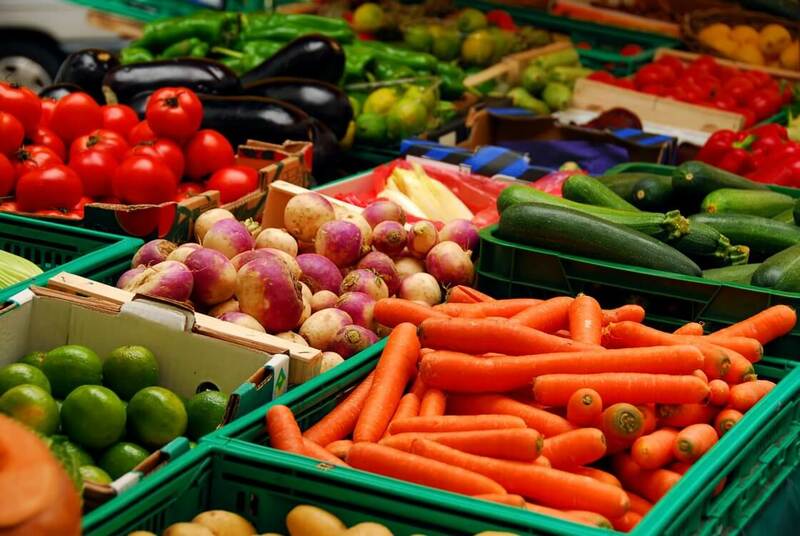 Conventionally grown produce often results in an inferior product. 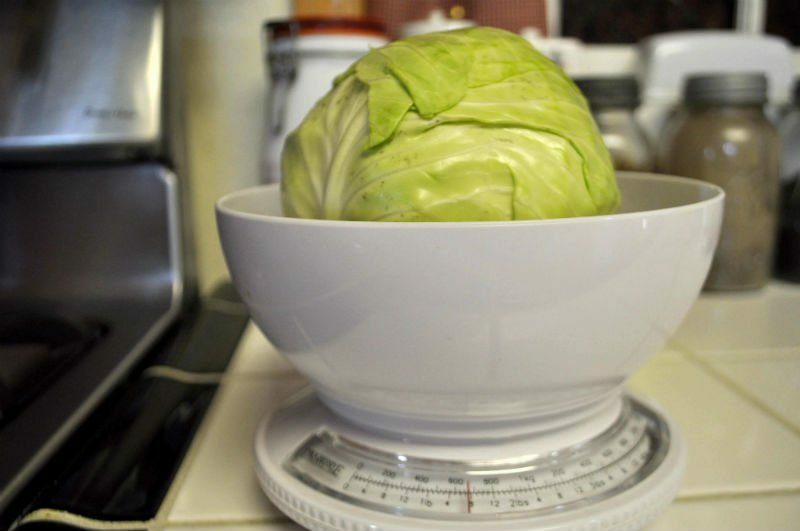 For quart jars (wide-mouth), select a head of cabbage that weighs about 1 1/4 to 1 1/2 pounds. Cut cabbage in half from the core to the top. Remove the core, if desired. Then shred the entire cabbage finely or coarsely, whatever your preference. 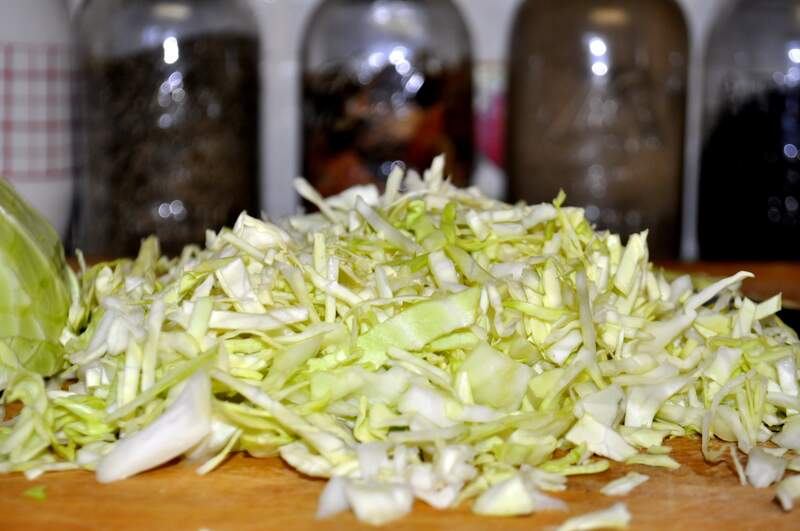 Coarse shredded cabbage is an option since cabbages can even be pickled whole with the lacto-fermentation process. 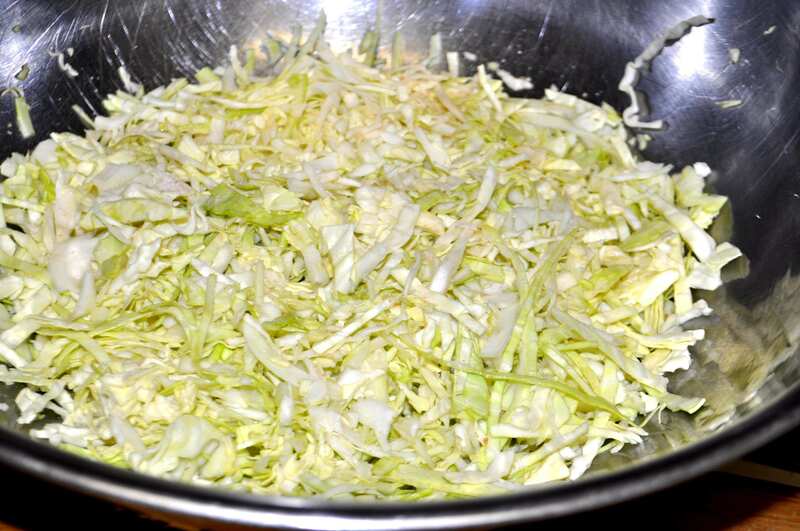 After shredding the cabbage, put a large handful of it in the bowl and sprinkle about 1/4 of the one tablespoon of salt over it. Continue in this fashion until all the cabbage is in the bowl and all of the salt has been sprinkled over it. The salt will begin to pull juices out of the cabbage. If you are using caraway seed, add it to the cabbage at this point and mix it in well. Lay cabbage, a little at a time, in mason jar. Tamp down with an appropriate utensil (I found the one in the photos at a thrift shop for under a dollar). This process pulls the juices out of the shredded cabbage. If you’re using bay leaves or juniper berries, lay them in on the layers of cabbage. As you lay in more cabbage continue to tamp it down. 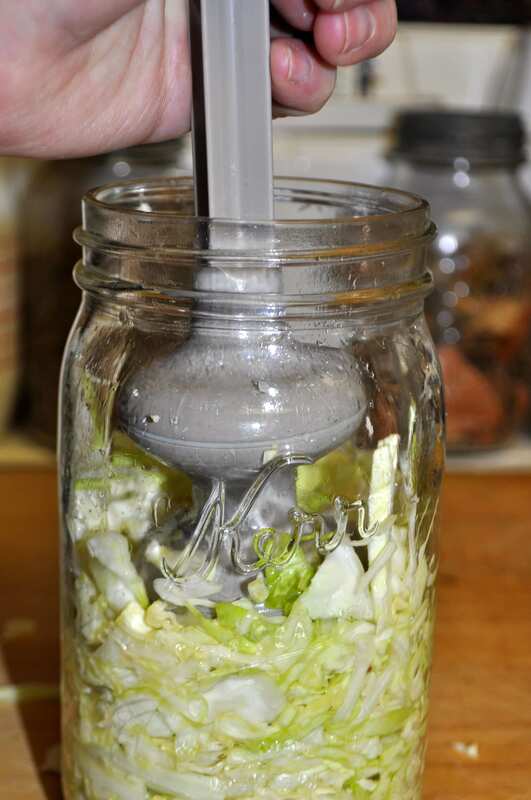 You should not have any difficulty getting all of the cabbage into your quart jar. For this jar of sauerkraut I added juniper berries. 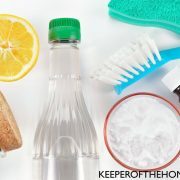 If liquid level is low in jar, add several tablespoons full of filtered water with a pinch of salt stirred in to raise the liquid level in the jar. Then place the two jar seals, rubberized side up, on top of the cabbage, side by side to hold cabbage under liquid. 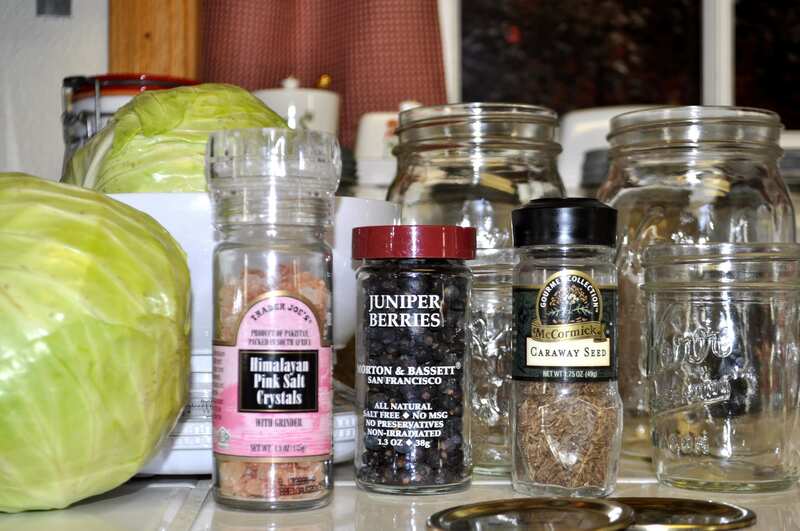 Fill the half-pint jar with water and set on top of the seals to hold the cabbage under the liquid. Press down on the small jar to raise the level of the liquid. Cover both jars with a muslin (or similar) cloth to keep contents free of dust, fruit flies, etc. 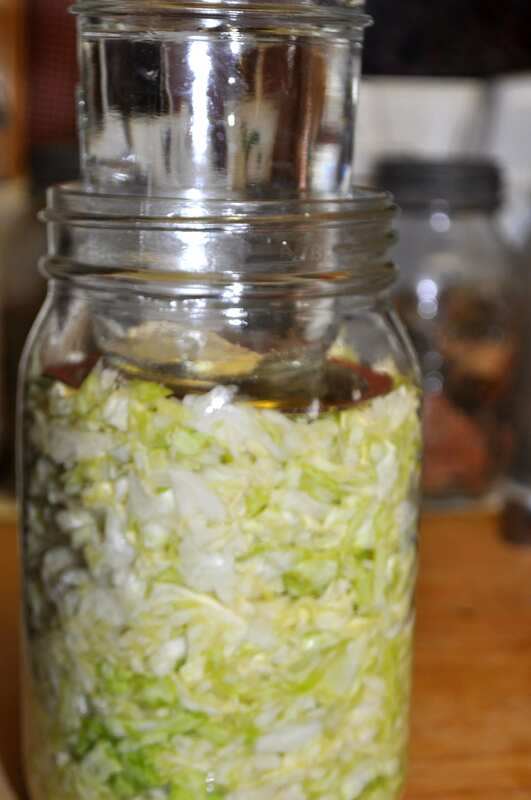 If the liquid level is still not above the cabbage, check it every few hours, pressing down on the small jar. The liquid level should rise a little more each time. After 24 hours if cabbage is still above the liquid, add a few more tablespoons full of filtered water with a pinch of salt stirred in. As you can see in this photo, the liquid is low in the jar. But after about 12 hours, enough liquid had been produced to cover the cabbage. Keep jar covered and at room temperature for about three days, then cap tightly with a seal and ring band and transfer to refrigerator. Though your sauerkraut can be eaten immediately, for maximum flavor, wait about a month. The end product – a jar of cabbage transformed into nutrient dense, delicious sauerkraut, ready for the cabbage patch kid to devour. 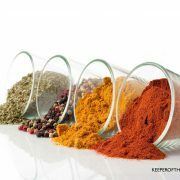 Since this is a food with beneficial bacteria, the optimum way to serve it is cold or at room temperature. Heating it kills off all the good stuff, so think of eating it as you would a pickle – cold and crunchy. YUM! More info and recipes here and also here and a few more here. 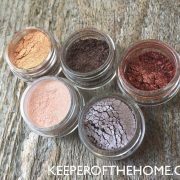 On my blog, Franziska’s Pantry, I have five very interesting videos posted. Love this! 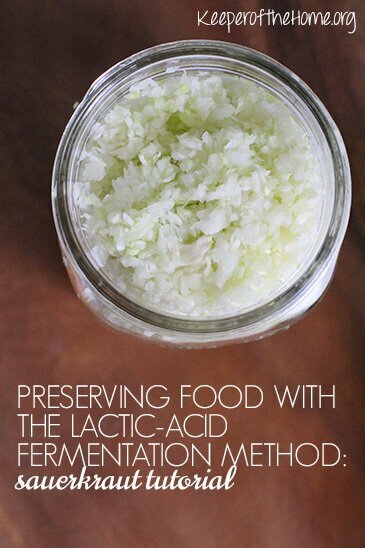 Have you experimented with making your own lacto-fermented foods? 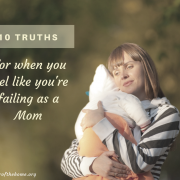 What successes (or flops – we all learn from the imperfections) have been your experience? How much salt do you put in total? We just used the Nourishing Traditions recipe the other day for a first try. It asked for 2 Tablespoons salt and that was way to much, its nasty salty. @Christy, and another book I was reading only called for 1 tsp, 6xs less! I’m confused! When I did my very first batch of sauerkraut, I too used the recipe from Nourishing Traditions and added 2 tablespoons of salt. Though nearly all of its recipes have been wonderful, I have to say that N.T. got this one wrong. We couldn’t eat that batch. I now use one tablespoon as indicated above and the kraut comes out just like it should – delicious and well-preserved. For the batch you’ve already made, if I were you, I would do up another recipe without the salt and add the first salty batch to it. Mix it till the salty batch is completely combined with then new batch and put it in jars to set out for 2-3 days. Then refrigerate. @Sharon Kaufman, Thank you for clearing that up Sharon. I will try it this way. I’ve always turned up my nose at saurekraut – pickled cabbage? No thank you! 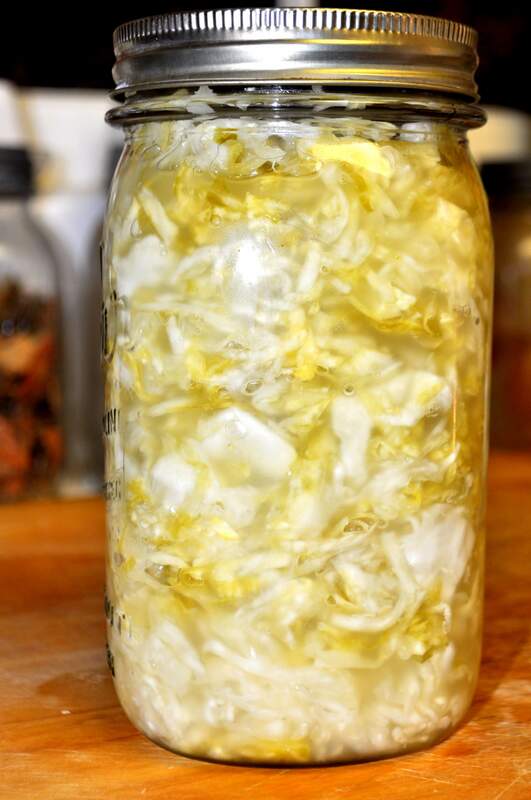 However, since I’ve started eating traditionally, I’ve read over and over about the health benefits of homemade, lacto-fermented sauerkraut and with this easy tutorial I just might try it! I have to admit, it looks a heck of a lot more appetizing than the brownish, yellowish stuff that comes out of a can! Thank you for that beautiful post. I have never agreed with the other methods I have seen where you pound the cabbage until the liquid is released. I never believed that our foremothers would spend the time or energy pounding their produce when salt would pull it out naturally. Your pictures are great showing each step in detail. I may have to go get some cabbage tonight. I also love your method. A large handful of cabbage and a sprinkle of salt. When you cook this way you become one with food. If it doesn’t turn out cabbage and salt are cheap. Throw it away and try it again. For the answer to your question, take a look at my response to Christy above. Nice to hear from you! You’ve inspired me to try making mine again. I tried once and we just didn’t enjoy it, even though we love sauerkraut. Since then, I’ve been buying two brands that make truly raw, fermented sauerkraut, Pickled Planet and Bubbie’s. They’re delicious, but it is definitely more expensive and it would be nice to just make it myself, especially once my garden gets rolling. Thanks, Sharon! Thanks so much for the comment. Making my own as opposed to buying really does save money at the check-out stand. When I don’t make my own, I pay dearly at the grocery store – $5-$6 per quart as compared to $1.20 per quart of homemade. Can I ask, what went wrong with your first batch of sauerkraut? I didn’t enjoy the first quart I made either. The recipe from Nourishing Traditions called for two tablespoons of salt which made the sauerkraut inedible. It was disappointing to say the least. Don’t give up; try it again. Hopefully you will be delighted the second time. Thank you very much for writing in to Bubbies, we are always pleased to hear from one of our customers and we would be delighted to tell you more about our food products in regards to whether they are raw, heated, or pasteurized. Our Pure Kosher Dills, Dill Relish, Pickled Green Tomatoes and Sauerkraut are all naturally fermented and cured in salt water brine using a lacto-fermentation process. These products contain live cultures and the enzymes that form from a natural fermentation. The Pure Kosher Dills, Dill Relish and Pickled Green Tomatoes are 100% raw; the Sauerkraut in the jars has been flash heated but not pasteurized. This means that the sauerkraut is neither pasteurized nor raw. We were forced to begin heating our jarred Sauerkraut to calm the cultures inside because they were causing the kraut to continue to ferment too much in turn causing a buildup of gas that then results in brine leaking all over our distributor’s and retailer’s equipment and shelving. When we heat our jarred Sauerkraut, it is quickly raised to about 130 degrees and then sealed in the jars. The goal here is not to eliminate all the beneficial cultures, but rather to stifle them so they won’t cause the jars to leak. While the heating we do for our Sauerkraut is only intended to calm the gas producing nature of the product with the specific goal in mind not to eliminate the beneficial cultures. We do not claim that this product is raw for these reasons, but it still does have live bacteria. From our testing, it is above 140 degrees that you really begin to eliminate the cultures present in our products on a massive scale. It is important to note that our Sauerkraut is very crisp, which means there are still vegetable fibers left intact that have not been broken down by the fermentation process. The vegetable fibers are the complex carbohydrates that break down into the simpler food, providing the live cultures their necessary fuel for the fermentation process. When we pack the Sauerkraut, it is still producing too much gas from the fermentation process to remain sealed in the jars in a raw state. The heating we do to this product allows the Sauerkraut to remain fit for distribution and for sale on your grocery store shelf while still being a live food. Hopefully this information will help in your continued enjoyment of our products and make it easier for your remain a loyal customer. Wishing you the very best in Food and Health! @Christy, Thanks so much for sharing that< Christy. I had never thought to email them to find out specifically what they do, but I'm really glad to know this. It may change my buying habits, unfortunately, because we specifically buy the sauerkraut for the benefit of as much good bacteria as we can get. Also, how would you store this long term, say over wintering? Thanks so much. Great post! Thank you ! This is great information! I am wondering if I can use well water? If not, how about distilled water? If not either of these what water can I buy to use? We don’t have filtered water.. I would think well water would be fine – lots of minerals to boot! I tried making the Ginger Carrots recipe from Nourishing Traditions, and it was way too salty to eat. It calls for 1 tablespoon of sea salt for one quart jar, or an additional tablespoon if whey is not available (but I used whey, so only 1 T of salt). Maybe they’re getting their tablespoons and teaspoons mixed up? @Ginny, Hmm, I think lots of people have found the NT recipes too salty. Perhaps it’s an issue of the type of salt you use? If it’s something chunky, like a coarse sea salt, a Tbsp might not be as much, as if you have regular salt or a finer sea salt like I use. But I would generally advise using half the salt recommended, as I almost always find those recipes too salty (at least, the fermented ones, not the ones in the other parts of the book). I finally had the time to make this wonderful sauerkraut. I couldn’t believe how EASY it was. I did notice a few things that make me wonder if I did it wrong. First, I didn’t have to add any additional water and in fact the liquid almost spilled out of the top after 48 hours on the counter. I had to remove almost all the water in the small jar used to keep the cabbage down. Is this because I used to much salt or is it a matter of how much moisture is in each cabbage. Second, even with all that extra liquid when I put it in the fridge I had a hard time getting any liquid to cover the cabbage. 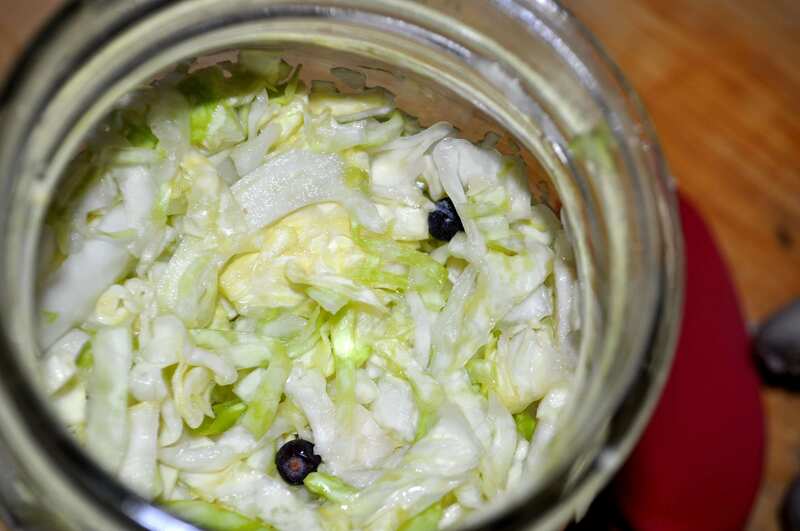 By the time my kids devoured the kraut there was not even a half inch of liquid at the bottom… Do you need to keep liquid covering the cabbage after it ferments? I fermented it on my counter for 4 days. I bought another head of cabbage and a head of red cabbage. I want to try it again, but with a mix of green and red (and maybe some carrots and onions) I just want to make sure I’m doing this right. Just wanted to add a follow-up. I forgot that I had a small amount left on my first jar that I made and came across it yesterday. I was a little scared because most things don’t last that long in the fridge. I am happy to say that it is still delicious! Crunchy and wonderful. I can’t believe it. Cabbage that is crunchy and wonderful after a month. I think I’ll leave some again and see how long it will keep. Mine did the same thing..I had plenty of liquid and each day even with a lid on it, leaked out of the jar. By the end of day 3, there was a gap at the bottom of the jar where the cabbage had moved upward pushing against the lid..maybe I didn’t have it full enough..I’m not sure. Hi, I’ve just started reading up on lacto-fermentation and I have a couple questions. I live in South Sudan and the temperature in our house is typically around the lower 30s C (90-ish F) or hotter. I noticed the recipe above mentions leaving the food at room temperature to ferment. Does lacto-fermentation work in high temps, or would the food get spoiled? Also, we don’t have sea salt here. I know sea salt is healthier, but would lacto-fermentation recipes work as well with regular processed salt? Thanks for your help! I’ve been lacto-fermenting (with the whey from cheese I make)…all varieties of veggies for years and years…absolutely love them. I did a batch of mixed veggie ferment several weeks ago with the intention of packaging it for gifts for folks who love my fermented mix. I just took it out of the fridge to put it into smaller containers…and it smelled great…so I took a nibble. It wasn’t the least bit sour! It was sour three weeks ago and I was sure it would be a great batch. What could have happened? and is there anyway to reclaim it? The veggies are still very firm and dente. I have just started making fermented sauerkraut and was wondering if adding ACV to the finished product would be ok? My family likes the vinegary taste of mainstream sauerkraut but of course know the lacto-fermented is better. There is never any vinegar in sauerkraut – look at the labels. It’s just cabbage and salt (they add other stuff if it’s in glass jars to keep the color – and I hate that). If it has vinegar it’s pickled cabbage. So all the sourness is from lactic acid (and some other acids too) that form from the fermentation of the cabbage. could you help me find a recipe for no salt – using lemon juice instead as a am highly sensitive to salt. How much leMon juice? do I need a starter? Thanks so much Joan. I just heard on the Dr. Mercola website an interview that he did with a Carolina Barringer – she makes all kinds of foods like this and sometimes she uses celery juice instead of the salt . . . great idea!!! 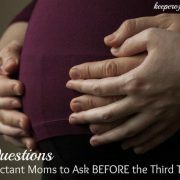 So you leave the jars in the frig for about a month before eating…how long is it good for if not opened? I would like to do the fermenting process you spoke of, but I want jars filled that will last a long time…like canning. Can you tell me if any of the veggies can be left in the closet long term? To wait 24 hours instead?